The kitchen, or pantry, is mostly off-limits to children. This is usually because it contains cooking apparatus that are otherwise harmful to kids, such as knives, forks and scissors. Worst of all, children could play with a flammable equipment, such as stoves and microwaves. However, with good parental supervision, not only can you trust your children to be safe inside the kitchen, you can even enjoy cleaning up after meals together. You might think that the kitchen is only a workplace, a room that’s only for cooking dishes and whatnot. But, as is the case with most household activities, you can involve your kids in it, turning it into a fun bonding activity with your children. Here we’ll talk about designing a kitchen that’s not only for you, but also for your kids to appreciate, because it’s always better to keep everyone’s tastes in deciding how your house should look. Why Should you Design your Kitchen? Just because the kitchen is for cooking and preparing meals doesn’t mean you can disregard its physical appearance. Study shows that people in the kitchen make better food when working in a place that’s pleasing to the eyes. However, it’s always better to color it with shades that are appetizing, or are associated with a good meal. Also, personalizing your kitchen’s design, means that you’re going to feel a sense of belonging in that environment. You will be working in a kitchen that’s made by your family, for your family and no one else’s. Plot out how much space you want for your kitchen space. Some factors that should be considered are: The number of people in the house • The total size of the house • The sizes of the other rooms in the house • The sizes and number of appliances and furniture that you plan to add to your kitchen If your building a kitchen, make sure that you have sufficient electrical and water sources that are functional and safe. Check for correct wirings, proper piping, and make sure you’re up to code. Before putting in your appliances, such as, refrigerator, dish washers, ovens and other objects, modify your flooring and walls. There will be a guide to flooring and wall designing further on. Consider which materials you’re going to use in your kitchen. Some essentials would be a stove, refrigerator, microwave, and cabinets where you can put in your utensils and other cooking materials. Now let’s talk about your kitchen’s surfaces. The designs of its floor and walls are very important because they set the tone for the whole room, and the emotions felt by anyone in the area. If you want to play it safe, you may go for polished hardwood for that homey, earthy feel. This surface is very popular amongst homeowners and is very easy to clean too. But if you prefer a more grandiose aura, you may pick white marble tiles. However, they stain easily and require higher maintenance. Carpets should be avoided since you’ll be working with food. From time to time accidents happen, and you might get food stains on your kitchen carpet. For wallpapers, as mentioned before, it’s safest to select patterns that are very friendly and evoke emotions that are usually felt while enjoying a good meal. This way, everyone who is using the kitchen will get into the good food mood, whether preparing a simple sandwich or cooking up a Thanksgiving feast. The same can be said if you don’t want to paper up your kitchen walls, and paint them instead. The thing with kitchens is that, aside from the color scheme, it doesn’t require that much prettying up. You may resort to a few decorations, such as paintings, a clock and other personal accents, but not much else. Prioritize practicality and efficiency when picking out kitchen furniture. For example, when picking out kitchen counters, select the ones that you think will give you what you paid for. Sturdiness is always selected over flashiness. You could select counters that will hug your walls. There are shops that sell them, or if you prefer a more personalized touch, you can have them constructed by your favorite craftsmen. It might be a little pricier though. Also, keep compactness and space in consideration. It’s always a bonus if you can put two objects in one place. The same rules apply to seating. Always pick out the ones that take up less space, but serve their purpose well. 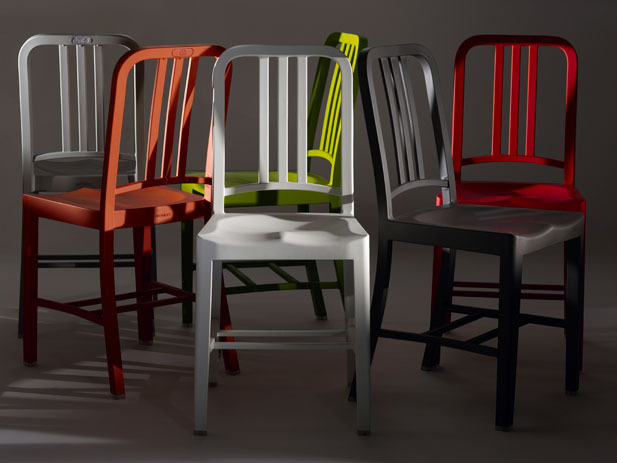 Pick out chairs that are simple and not bulky, like the Emeco 2006 Modern Stool. This is very lightweight, very tough and durable, and is very comfortable. It might not look like much, but it’s one of the best in the market. This is optional, but still very viable. You can buy the Emeco 2006 Stool Pad to go along with your stool. It’ll be a little more comfortable to sit on the chair, but of course, you’ll have to buy it separately. You can go as crazy-creative as you want in designing your kitchen, but always keep these in mind: space, practicality, durability, safety.